To celebrate World Animal Day I wanted to showcase some of my favourite ocean creatures who live in the intertidal zone. I just LOVE the shallow areas of our coastlines as they are so full of life, easy to access and harbour such diversity and unique beauty. 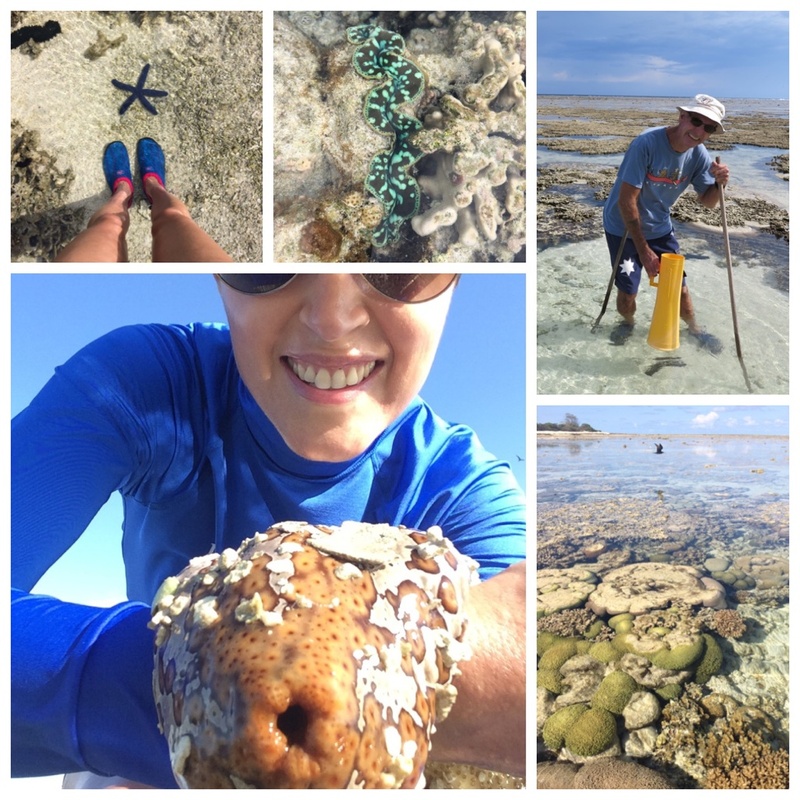 Like the super cute sea cucumber I’m holding here in the shallows of Lady Elliot Island, on the southern Great Barrier Reef. Did you know sea cucumbers have no brain, breathe through their bums and can vomit up their organs when in danger! Now that’s an animal worth celebrating on World Animal Day! From a very young age I played by the sea and explored rock pools and waded through the intertidal zone so that’s where my fascination for the shallow sea began and its never gone away. You can find so many beautiful and unusual creatures in the intertidal zone, which is my kind of fun (…which you can ‘sea’ I get from my Dad in the photos). I also find the intertidal zone amazing due to its beauty and its extremes. Imagine living in a home that is constantly changing, everyday! Only the toughest of sea creatures can live here as they are adapted to living in this harsh marine environment which includes being battered by waves, changing tides, sun and wind exposure, extreme temperatures and let’s not forget the predators! So next time you are by the sea don’t forget to ‘sea’ the life in the shallows. I know you will be amazed by what you ‘sea’! You can follow my creative marine journey via my alter ego Dr Suzie Starfish on Facebook (https://www.facebook.com/drsuziestarfish/) and @suepillans on Twitter and Instagram.